? Your next vacation could be out-of-this-world, if you would embrace adventure travel vacations. Let’s face it; taking the same vacation year after year can get old. Why not try something different, like a hiking trip to Costa Rica? Or maybe you’ll zoom off to New Zealand where you can try bungee jumping for the first time. Life is too short! Here are 10 reasons to experience adventure travel vacations right now. 1. You get to face your fear, whatever that is. Perhaps you’re afraid of heights. Book an Arizona hiking adventure and hike the various mountain parks, like Grand Canyon National Park. 2. You can learn new skills. If you take a rock climbing adventure, you’ll learn about the equipment and how to properly use it and perhaps can teach others – you may become an instructor. 3. You’ll cross something off your bucket list. Perhaps kayaking in the Caribbean is a dream you’ve had for a long time. You can’t cross it off your bucket list if you don’t take an adventure travel vacation. 4. You’ll develop a “go for it” attitude. Life is too short to sit on the sidelines. An adventure travel vacation can teach you how to embrace everything that life has to offer you. 5. You’ll gain patience. Hiking, kayaking, snorkeling, zip lining, or whatever adventure you seek, takes patience. You may not reach your destination quickly. Instead of wondering how much longer it will take, enjoy the journey and scenery. 6. You can test your photography skills. Maybe you secretly have a love for photography. Adventure travel vacations give you the opportunity to snap photos of nature and people. 7. You gain a sense of accomplishment. When you scuba dive for the first time, you’ll realize that you can do anything, if you focus on your goal and take the necessary steps to reach it. 8. You can meet new friends. Perhaps you’d like to expand your circle of friends. 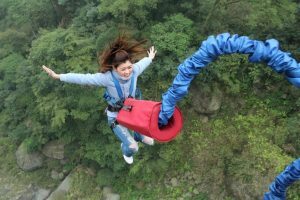 Going on adventure travel vacations gives you the chance to connect with like-minded people who won’t think you’re nuts for wanting to jump out of an airplane. 9. You can lose weight. Biking, hiking, and walking are great forms of exercise. No matter if you’re a new adventurer or an experienced one, you can release weight. Why? Because you’ll be doing a physical form of activity that will get your heart pumping and your body sweating. 10. You can meet the love of your life. Singles adventure travel is a great way to meet Mr. or Ms. Right who shares your love of adventure. Are You Ready to Embrace Adventure Travel Vacations? To spice up your life, choose adventure travel vacations. Imagine taking a Grand Canyon white water rafting tour. Not only do you get to rush down the Colorado River, but you’ll get to hike the Grand Canyon and explore its beauty. Or maybe you’d prefer overseas adventure travel. See yourself swishing down the snowy mountains of Switzerland. Isn’t it time that you’ve take a different type of vacation? You be it is! Want to take your family on an adventure of a lifetime? Get this family travel guide and start thinking about all of the fun experiences you can have together.